You know what I go to bed dreaming of? Gnocchi…Fluffy little pillows of gnocchi; my favorite of all being Sweet Potato Gnocchi! When I hear gnocchi, it makes me think Pinocchio. You too? I don’t know why, cuz that doesn’t even rhyme. It would have to be gnocchio. Although the singular of gnocchi is gnocco, so if ya put the two together it would make sense. Am I making any sense? Gnocchi are little Italian dumplings made from potatoes or semolina flour. I have to admit that I’ve only had potato gnocchi, the gnocchi made with semolina flour is known as Gnocchi alla Romana. Homemade gnocchi may be intimidating for some, but once you know The What and The How, it’s quite easy. Gnocchi making is more of a textural thing than an exact recipe thing; it took me a few tries before I got gnocchi making right; my first attempts did not yield fluffy pillows…at all. But I didn’t have anyone to show me, it was just trial and error. Now I’ve got the technique right, and I’ve included lots of pictures so that the novice gnocchi maker will know what the heck I’m talking about! The enemies of Sweet Potato Gnocchi are too much flour, and over working of the dough. The addition of ricotta cheese helps to lighten the dough, and the removal of much of the liquid from the ricotta and from the sweet potatoes means that less flour is used, which means that there is more of the flavor of sweet potatoes and also that the dumpling will be tender. The beauty of Sweet Potato Gnocchi is that they can be prepared and then cooked and eaten right away, or they can be frozen and cooked straight from the freezer; which makes them great to serve for a dinner party, or a holiday meal, because you can get the majority of the work done in advance! Serve these fluffy little pillows, with browned butter or with Creamy Blue Cheese Sauce and you’ll soon be dreaming of Sweet Potato Gnocchi too! Ricotta cheese makes the gnocchi nice and light; add some to a strainer that has been lined with paper towels, and allow this to sit in the refrigerator for a couple of hours, or even overnight. Roast a couple of pounds of sweet potatoes in a 400 degree oven for 50 to 60 minutes, depending upon the size of the sweet potatoes; until they are tender. When the sweet potatoes are cool enough to handle, remove the peel and place them in a clean, lint free kitchen towel. Squeeze out as much moisture as you are able. Allow the sweet potatoes to cool completely before adding the strained ricotta cheese, as well as some freshly grated nutmeg, cayenne pepper and salt. Stir in the flour, start by adding just 1 cup of flour. Add more flour if needed (the less flour in the gnocchi, the better the flavor and texture) until the dough comes into a sticky ball. It's best to work on a wooden surface from here on out. Lightly dust the board, and add just a tad of flour on the top to keep your hands from sticking in the dough. It's best not to add too much flour. Knead until the dough is smooth. Cut it into 8 equal pieces. Brush some of the flour away from the board so that the dough can be rolled into a 3/4 inch thick rope; too much flour on the board makes it difficult to roll the dough. Cut the rope into 1/2 inch pieces. Now there are a few methods for shaping the gnocchi; 1. You may leave them just as they are, fluffy little pillows! 2. You may just use a finger to create an indent in each gnocco. 3. You may roll each one down the back of a lightly floured fork to create ridges. 4. You can use a gnocchi roller which creates a pocket to hold sauce as well as ridges. Lay the gnocchi on a sheet pan that has been lined with parchment paper. You may cook and serve the gnocchi immediately, but do not refrigerate raw gnocchi or it will fall apart when cooked. Even if you only intend to serve Sweet Potato Gnocchi the next day, you may freeze the raw gnocchi in a single layer on a sheet pan, being sure to cover it with another layer of parchment paper. When it's frozen it can be put into bags. Some of my Italian friends like to immediately cook the raw gnocchi, add it too sauce, and then refrigerate or freeze the gnocchi in the sauce, and then re-heat it in the oven; though this won't work well for a cream based sauce. Cook the freshly made or frozen (straight from the freezer, not thawed) gnocchi in gently boiling, salted water. If you're cooking all of the gnocchi do it in batches so that you don't end up with a gloopy mess. 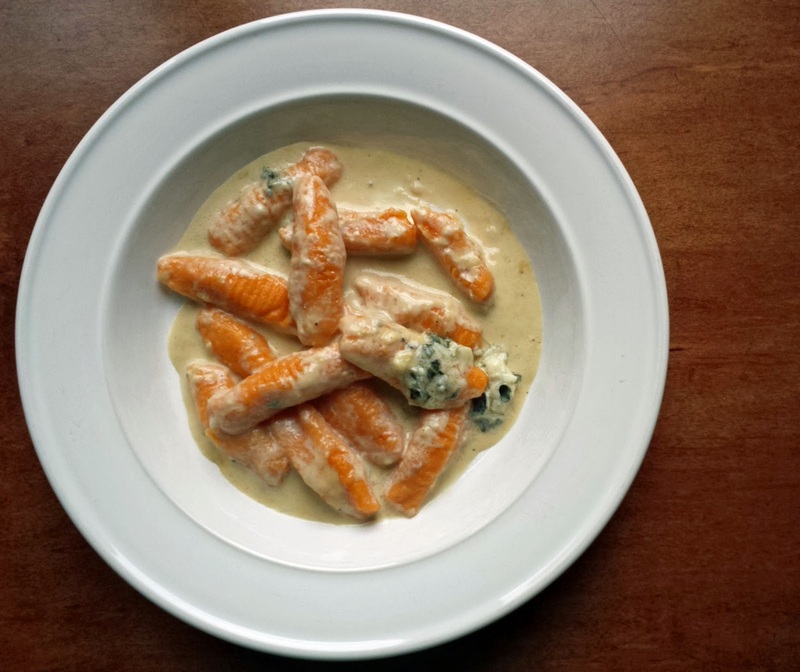 Sweet Potato Gnocchi is cooked when it floats to the top of the pan. Add the cooked gnocchi to your favorite sauce, or just browned butter. If cooking the gnocchi in batches, the first batch will hold in the sauce while the rest of it cooks. 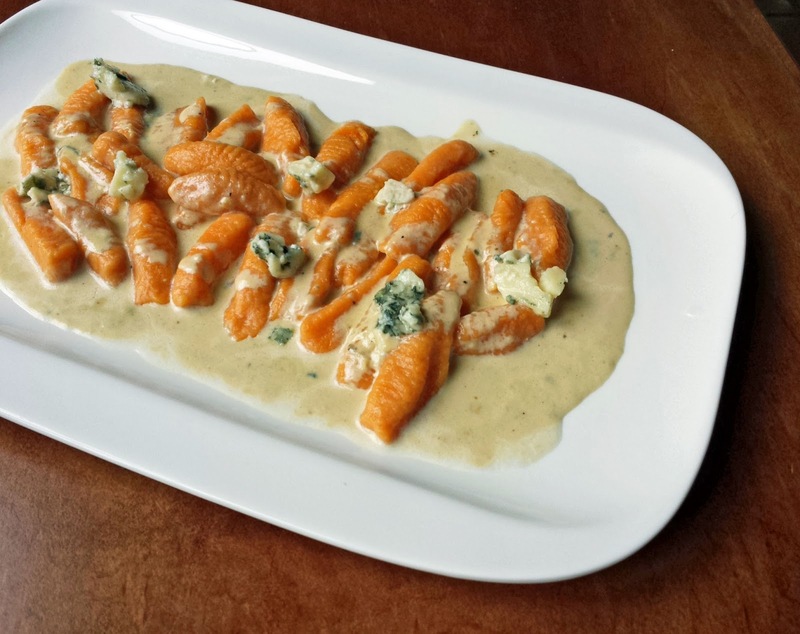 The recipe for Creamy Blue Cheese Sauce will be my next post! I'm dreaming up some other sauces to go with these lovely, fluffy pillows of Sweet Potato Gnocchi which might be a little crazy; hopefully crazy good! 1. Place a strainer that has been lined with paper towel over a bowl, and add the ricotta cheese to the strainer; cover and refrigerate for at least 2 hours (or overnight), in order to drain the excess moisture. 2. Pierce the skin of the sweet potatoes a few times and put them on a sheet pan and into a 400 degree oven to bake for 50 to 60 minutes until the sweet potatoes are tender. Remove and discard the skin from the sweet potatoes, and put the flesh into a clean kitchen towel. Squeeze the towel to remove as much water from the sweet potatoes as possible. Allow them to cool. 3. To a large bowl add the cooled sweet potatoes, drained ricotta cheese, nutmeg, cayenne, and salt; stir to combine. Add the flour, start with adding just 1 cup, stir it in with a fork, add more flour as needed (don’t add more flour than needed, less is better), just until the dough barely comes away from the sides of the bowl (it will still be a little sticky). 4. Dump the dough on to a wooden board that has been dusted with flour, add a little more flour to the top of the dough, and knead using your hands (remembering that less flour is better), until the dough is smooth. Cut the dough into 8 equal pieces and roll each piece into a rope that is ¾ inch in diameter. It’s easiest to roll the dough on a board dusted with very little flour. Cut each rope into about ½ inch pieces and shape each piece by one of these methods: A. Using a lightly floured wooden gnocchi roller. B. Rolling down the back of a lightly floured fork to make grooves. C. Making an indent in the center with your thumb. D. Do nothing and just love the little pillows the way they are. Lay the gnocchi onto sheet pans that have been lined with parchment (or wax) paper. 5. Cook the gnocchi immediately (or see the note below) in a large pot of gently boiling, salted water; add the gnocchi to the water in batches as to not overcrowd the pan. When the gnocchi float to the top, they’re cooked. Add the cooked gnocchi to your favorite sauce. Note: You may also freeze the raw gnocchi in a single layer on the parchment lined sheet pan being sure to place another piece of parchment paper over the gnocchi and put them into the freezer; once frozen the gnocchi can be stored in a freezer bag. Cook them from a frozen state (don’t thaw) the same way that fresh gnocchi is prepared. Do not refrigerate the uncooked gnocchi, as they will not hold together when they’re cooked. You may cook the gnocchi, add them to some sauce, then refrigerate them, and then reheat them; or just freeze them and cook them when you’re ready. We seriously are on the same wavelength, girly, because I've been planning a sweet tater gnocchi day! I've never made them and was going to seek out recipes, but look no further: you have everything I need right here! So exciting - I'll let ya know how they turn out! W all are gnocchi fans at home but I've never prepared them with sweet potatoes. Excellent recipe! You make it look so easy, now I want to try too!